LED furniture, plain and simple, is traditional furnishings made of a thick acrylic material with LED light diodes implanted inside. Most LED furniture can withstand up to 300lbs, making it a sturdy option for any environment. Due to the acrylic material, the furniture is waterproof and can be used indoors or outdoors. There are also multiple settings for most LED lights, ranging from flash or strobe to fade or smooth. Where is LED Furniture used? 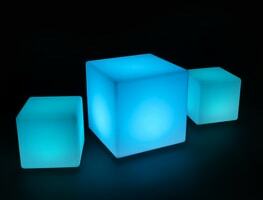 LED furniture is most commonly used in party settings like outdoor venues, bars, and nightclubs. 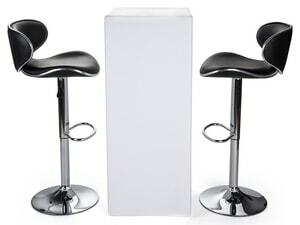 The LED chairs, stools, and cocktail tables are perfect to set the mood or to make a bold statement at any get-together. The beauty of these units is they can be used inside or outside and still have the same unique visual effect. While they’re most common at party functions, this furniture can spice up personal living rooms, add color to a child play area, or be placed by the pool. Even without the LED lights being on, the movable furniture has a clean and bright white exterior that is beautiful with any designer’s arrangements. The current LED fixtures in circulation today are just the tip of the iceberg when it comes to color display. What is so powerful about a good interior/exterior design is the emotions it evokes from those witnessing the color scheme. Every color has a plethora of emotions it can elicit. LED furniture allows for the host of any party to be able to manipulate these emotions in ways that best suits the specifications of the moment. Now, this might seem like some complicated psychological theory, but it could be as simple as having the LED pub tables be a calming blue to relax those sitting away from the bar. Click the image to visually understand the impact of color! This table gives examples of the variety of emotions that can be generated through color. It's important to keep in mind that color combinations are necessary to insure the desired emotion is evoked. For example if a party display has both black and purple, they will both complement eachother and emphasize elegance and nobility. What people might not understand when they choose furniture is the importance of color. For example, a high-top table color can change the ambiance of the establishment. A Friday night bar scene needs to have a much different mood and feel than a Wednesday afternoon meeting. With light-up furniture, setting the mood of a room couldn't be more simple — just choose the color of the LED lights! In the competition driven society we live in, it is important to stand out whenever given the opportunity. With LED furniture, you're one step in front of the business next door. 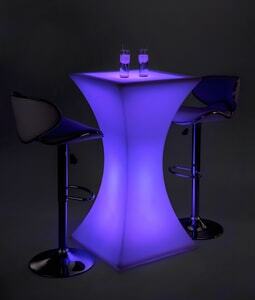 Light up your workspace, bar, outdoor venue or nightclub (literally). While one color or color scheme can be the emotional path that a nightclub or bar wants to lead their workers down, it is also important to reinvigorate employees. By changing a color scheme, the same emotions can be conjured up with a new perspective. Never underestimate the importance of color again, with LED furniture.